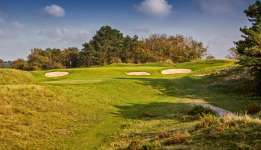 The Royal Hague Golf Club, as it is known in English, is the oldest golf club in Holland and was founded in 1893 on linksland that was destroyed during World War II. The club’s current course was actually designed by Harry Colt for a wealthy Dutch golfer in 1938, who then sold the layout to the homeless golf club in the late 1940’s. Despite its location, two miles from the North Sea, Royal Hague is a dramatic big dune course that has a strong seaside feeling with mighty fairways that crash and tumble constantly and feature little shaping or man-made design outside the typically understated green sites. Some holes are almost dizzying in their scale, plunging and rising with dramatic proportions. Giving the layout its teeth are a number of heroic drives over ravines and gullies, plus fierce back tees on holes such as the 6th, 7th, 8th, 13th and 16th. 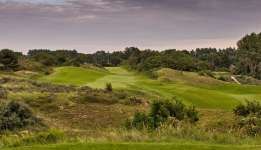 Course highlights include the short 7th, which is a terrific hole blind over a hill then down to a delicious green nestled beside a large dune. The tumbling and rising 9th is another fine hole as is the more subtle 11th and the wild 15th with its green beside a hill and beyond a frontal mound. The sidehill 16th across a ravine and then a small knoll, and the tree-lined par five finisher are also dynamic golf holes. A well-preserved classic Colt layout, most of the original features here are retained although all eighteen greens were recently renovated by Frank Pont after almost seventy years of wear and tear.